Boulder, Colo. • March 27, 2018—The Brewers Association (BA)—the trade association representing small and independent1 American craft brewers—today released 2017 data on U.S. craft brewing2 growth. With more than 6,300 breweries operating during the year, small and independent craft brewers represent 12.7 percent market share by volume of the overall beer industry. 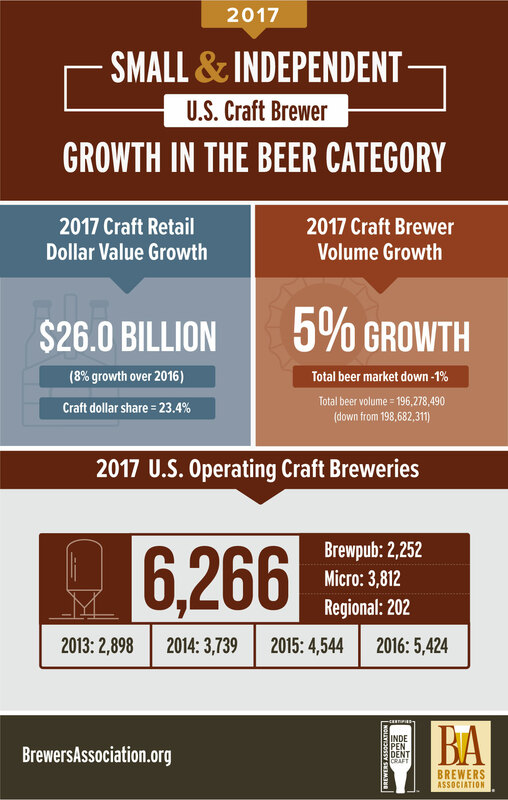 In 2017, craft brewers produced 25.4 million barrels, and saw a 5 percent rise in volume3 on a comparable base and an 8 percent increase in retail dollar value. Retail dollar value was estimated at 26.0 billion, representing 23.4 percent market share. Microbreweries and brewpubs delivered 76 percent of the craft brewer growth. Craft brewing’s growth occurred in the context of a total beer market which dropped 1 percent by volume in 2017. 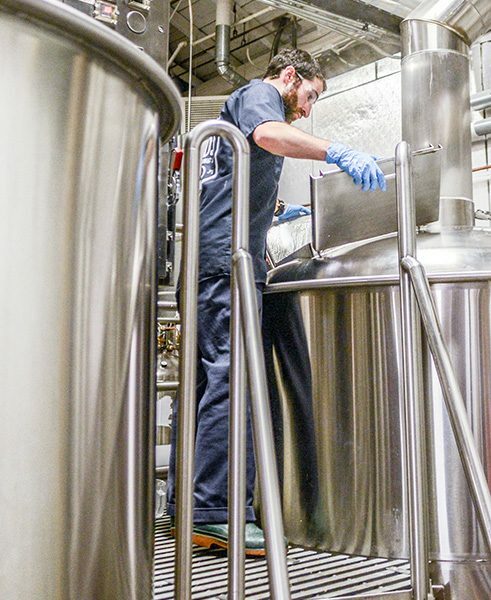 Additionally, in 2017 the number of operating breweries in the U.S. grew 16 percent, totaling 6,372 breweries, broken down as follows: 3,812 microbreweries, 2,252 brewpubs, 202 regional craft breweries and 106 large or otherwise non-craft brewers. Small and independent breweries account for 98 percent of the breweries in operation. Throughout the year, there were 997 new brewery openings and only 165 closings— a closing rate of just 2.6 percent. 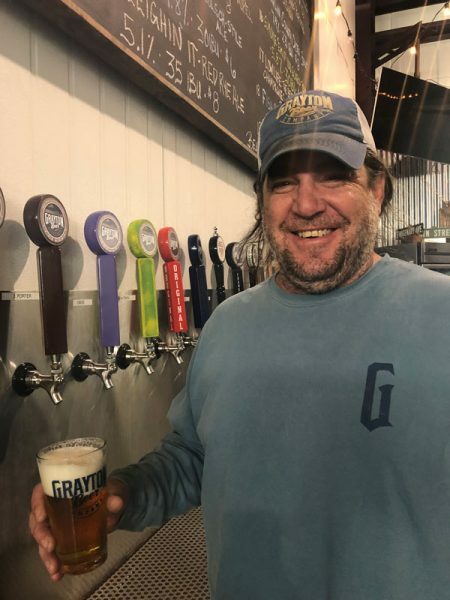 Combined with already existing and established breweries and brewpubs, craft brewers provided more than 135,000 jobs, an increase of greater than 6,000 from the previous year. To educate beer lovers about which beers are independently produced, the BA launched the certified independent seal in June 2017. 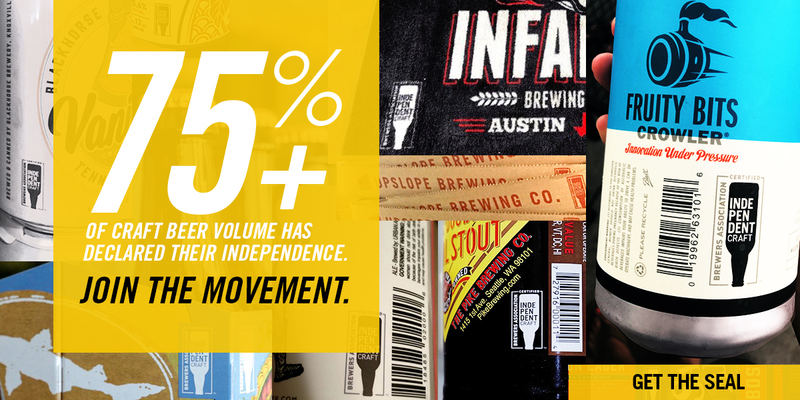 More than 3,100 independent brewers have committed to adopting it. Note: Numbers are preliminary. See additional methodology insights from Bart Watson, chief economist. A more extensive analysis will be released during the Craft Brewers Conference & BrewExpo America® in Nashville, Tennessee from April 30 – May 3. The full 2017 industry analysis will be published in the May/June 2018 issue of The New Brewer, highlighting regional trends and production by individual breweries. 2Absolute figures reflect the dynamic craft brewer data set as specified by the craft brewer definition. Growth numbers are presented on a comparable base. Full methodology. The Brewers Association (BA) is the not-for-profit trade association dedicated to small and independent American brewers, their beers and the community of brewing enthusiasts. The BA represents 4,000-plus U.S. breweries. The BA’s independent craft brewer seal is a widely adopted symbol that differentiates beers by small and independent craft brewers. The BA organizes events including the World Beer Cup℠, Great American Beer Festival®, Craft Brewers Conference & BrewExpo America®, SAVOR℠: An American Craft Beer & Food Experience, Homebrew Con, National Homebrew Competition and American Craft Beer Week®. The BA publishes The New Brewer® magazine, and Brewers Publications™ is the leading publisher of brewing literature in the U.S. Beer lovers are invited to learn more about the dynamic world of craft beer at CraftBeer.com and about homebrewing via the BA’s American Homebrewers Association and the free Brew Guru™ mobile app. Follow us on Facebook, Instagram and Twitter.